Vivo just announced the V15 Pro for the Philippine market, with preorders starting today, March 21, and ending on April 11. 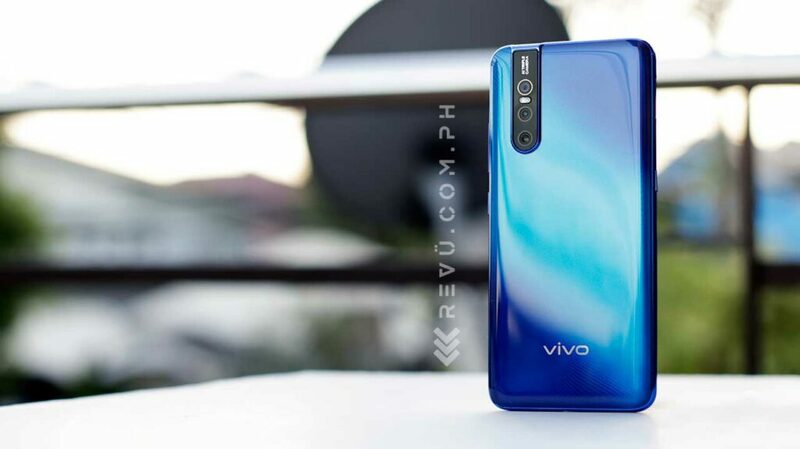 In the Philippines, the Vivo V15 Pro is priced at P23,999 (roughly $455 converted), which is a bit more than what some midrange smartphones cost these days. But then again, these devices don’t come with a motorized pop-up camera; a full, no-notch screen; or Qualcomm’s latest Snapdragon 675 processor mated to 8GB RAM either, so Vivo can at least justify its pricing with flagship-grade features and performance. 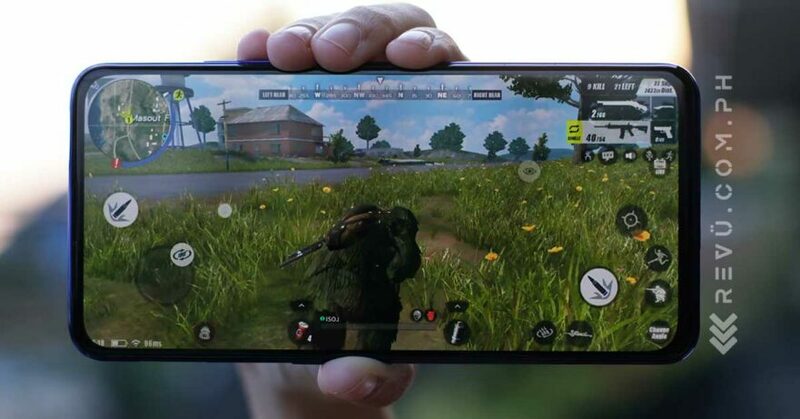 And as we found out earlier, the V15 Pro also delivers good gaming speed, even in modern, graphics-intensive games such as Rules of Survival, PUBG Mobile, Arena of Valor, Mobile Legends, and NBA 2K19. We’ve been so impressed with its performance that we decided to share our observations regarding how well the phone handles those titles we mentioned, as well as some things to keep in mind if you’re planning to get the unit to play high-end games. But before anything else, let’s talk about the chipset responsible for the V15 Pro’s surprisingly good gaming (and compute) chops — the Qualcomm Snapdragon 675, which the Vivo phone also debuts in the Philippines. The Snapdragon 675 is fabricated using Samsung’s 11-nanometer process and includes two high-performance Cortex-A76 cores clocked at 2GHz and six efficient Cortex-A55 cores operating at 1.8GHz, which brings the total number of cores to eight. It also integrates an Adreno 612 graphics chip, which Qualcomm has optimized to run popular game engines better compared to previous Snapdragon 600 and Snapdragon 700 series chips. There are other highlights, like support for 48-megapixel cameras or a single 192-megapixel camera and 4K video capture, which we won’t go into detail here. In terms of real-world use, the Snapdragon 675 is noticeably faster than the Snapdragon 660 and comparable to the Snapdragon 710, which is on a par with older flagship processors. It trumps the MediaTek Helio P60 and Helio P70 comprehensively while keeping efficiency good during those times the phone is performing highly demanding tasks. The Snapdragon 675 can even hold its own against the most powerful hardware out there today, although it might not show in the benchmarks. 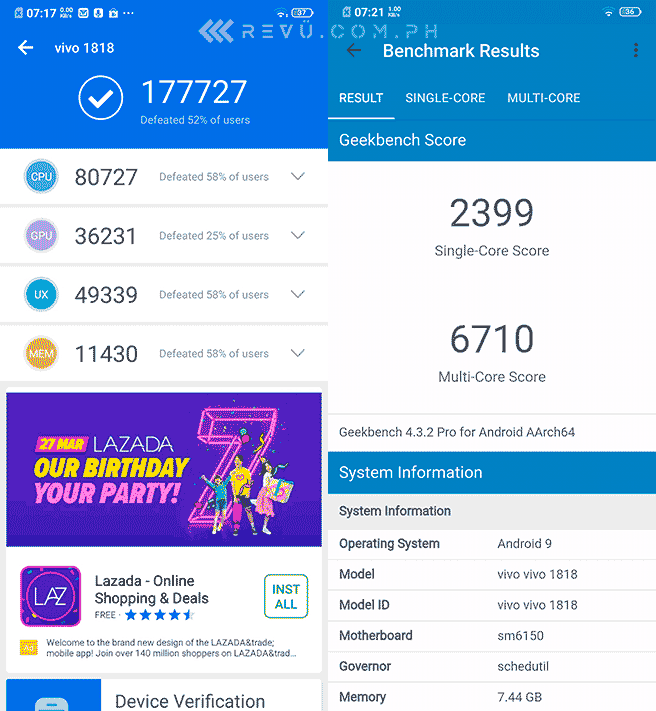 And speaking of, our Vivo V15 Pro with 8GB RAM managed to hit 177,727 points on Antutu Benchmark. It scored 2,399 (single-core score) and 6,710 (multi-core score) on Geekbench 4. Those scores are higher than the ones we got on the Snapdragon 710-based OPPO R17 Pro. Unfortunately, we weren’t able to successfully run the GameBench app for desktop and mobile on our unit, which would have given us the opportunity to monitor the frame rate and battery usage of games while they’re running. It might be because the Snapdragon 675 is quite new to the market, and the developers of the app have yet to update it to support this silicon. Okay, so now that we got that tidbit of the Snapdragon 675 out of the way, let’s talk gaming. This is one of the biggest battle-royale games on mobile, where up to 120 unarmed players are parachuted onto a gigantic island map to scavenge for weapons and equipment and fight until the last one stands. It’s free to play, although there are many in-game purchases available — the majority are cosmetic customizations — to enhance a player’s experience. The Vivo V15 Pro is able to run Rules of Survival at the highest settings (Ultra, in this case) without any major slowdowns, even when the fighting gets too thick and intense. We also didn’t notice any stuttering while driving around the map in a vehicle. So yes, the V15 Pro definitely passes the eye test with flying colors. PUBG is another popular last-man-standing game for Android and iOS devices, although this particular title boasts a heavier emphasis on realism in everything from weapons to graphics style. Like Rules of Survival — and unlike its PC counterpart — PUBG Mobile is free to download, but loot boxes and micro-transactions are there if you feel compelled to spend your way to cooler-looking gear. The game runs great at HD resolution with the high-frame-rate option enabled, something most phones, including those in the midrange, struggle with. Additionally, there’s no noticeable input lag during gameplay, which can certainly hurt your experience. We have zero complaints. Perhaps this game needs no introduction to the mobile-gaming crowd. But to recap, NBA 2K19 brings improved graphics and gameplay to the best basketball series on smaller screens. What’s more, you’ll only need to pay for it once, then you can own it forever. NBA 2K19 runs flawlessly at the highest graphics settings available, even with Cloth Simulation turned on. And while we don’t have the benchmarks to back the eye test up, the Vivo V15 Pro doesn’t seem to have any problems running the game at a frame rate higher than 30 frames per second. We wouldn’t call Mobile Legends a particularly demanding multiplayer online battle arena game, or MOBA, but it has 3D art and the graphics looks nice overall. It runs about as well as you can expect a modern game to run on this setup, but High Frame Rate mode isn’t supported, at least for now. This is completely understandable given how new the Snapdragon 675 is, but it’s no less surprising when you consider that other MOBAs can enable the same feature without developer intervention. Arena of Valor is a MOBA similar to Mobile Legends, and it’s also got a huge player base in Asia. It’s got some nicer graphics as well, which means more work for the CPU and GPU. Unlike Mobile Legends, this game supports high-frame-rate gameplay on the V15 Pro, and using the in-game FPS counter, you’ll see that, with the highest graphics preset, it runs close to 60 frames per second, which is the most you can get on any mobile device. To make games run more smoothly on the phone and minimize visual interruptions on the screen, the V15 Pro has its own gaming mode called Game Cube. It prioritizes resources during gameplay and offers a bunch of settings that can mute notifications, block incoming calls, and enable picture-in-picture, so you can still chat with your friends without dipping in and out of games. Under the Esports tab, there are several additional settings to improve gameplay, including one that will help regulate the phone’s temperature while gaming. It’s a nice touch; although we can’t tell for sure, it does seem to make a difference. The Vivo V15 Pro is a respectable piece of gaming hardware, in large part thank to the excellent Qualcomm Snapdragon 675 chip inside it. Coupled with 8GB RAM, it handled every game we threw at it with relative ease, tackling Rules of Survival, PUBG Mobile, NBA 2K19, and more with zero issues. If you’re after one of the best non-flagship phones for gaming on Android, look no further. The built-in gaming mode, on the other hand, will not only mute notifications but will also ensure that most, if not all, the phone’s processing power is diverted to gameplay. And hey, the 6.39-inch Super AMOLED screen is excellent for gaming, too. It’s a bit expensive, with the 8GB RAM model priced at P23,999 ($455) in the Philippines. But if you’re after one of the best non-flagship phones for gaming on Android, look no further.